ARROWSIC — Sometimes people tease scientist Jack Witham. Like about how he must know the name of each of the 32,000 trees in the Holt Research Forest. “Hardly,” Witham said, scoffing just a little as he tromped through the woods. For one thing, although every tree in this forest bigger than 4 inches in diameter has been tagged, mostly by Witham, they are numbered, not named. He paused in a spot not far from the highest point in the 300-acre forest, a wooded ledge. A red squirrel raced down a nearby spruce. “I probably have touched them all,” Witham conceded. Thirty-six years ago, Witham signed on for a new project in these woods and in a sense, he’s never left. He even lived in the Holt Research Forest for awhile, in a log cabin designed by the landowner who gave the forest to the University of Maine for a long-term study of a midcoast oak and pine forest ecosystem. 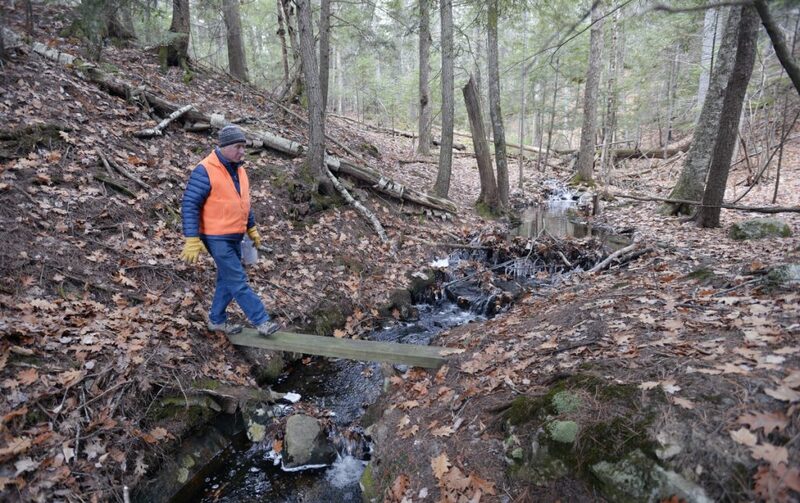 Witham crosses a footbridge in the Holt Forest, where he has worked for 36 years. The forest is a place of deep stillness. No sounds of cars penetrate its quiet. Geese honking overhead were the only other voices heard during a nearly two-hour walk through these woods, which press up against Sewell Pond to the east and Back River to the west. 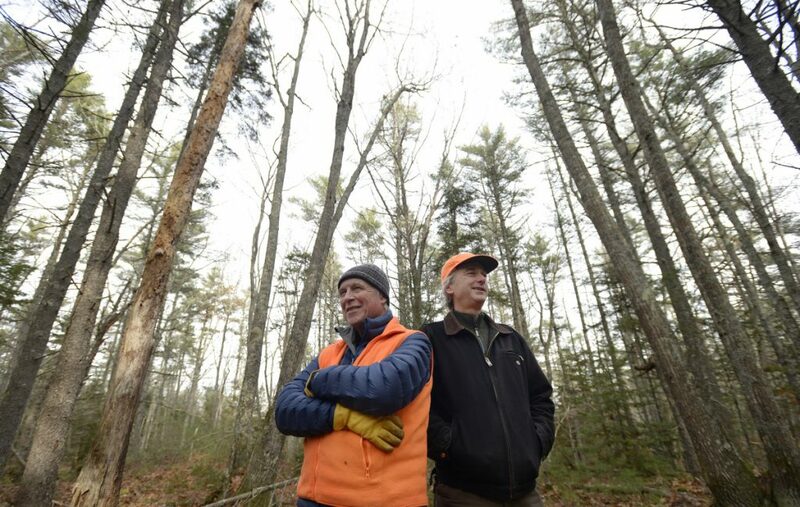 It is remarkable for how untouched it is – recreation has been discouraged, since it is a research center, currently funded by the Maine TREE Foundation (TREE stands for Timber Research and Environmental Education) and for the degree it has been studied since 1983. Of all the forests in this highly wooded state, Holt is likely the best known on centimeter by centimeter basis, despite how few people visit. It’s been the site of studies by the University of Maine’s College of Natural Sciences, Forestry, & Agriculture through the Center for Research on Sustainable Forests, as well as the School of Forest Resources, and the Department of Wildlife, Fisheries, and Conservation Biology. 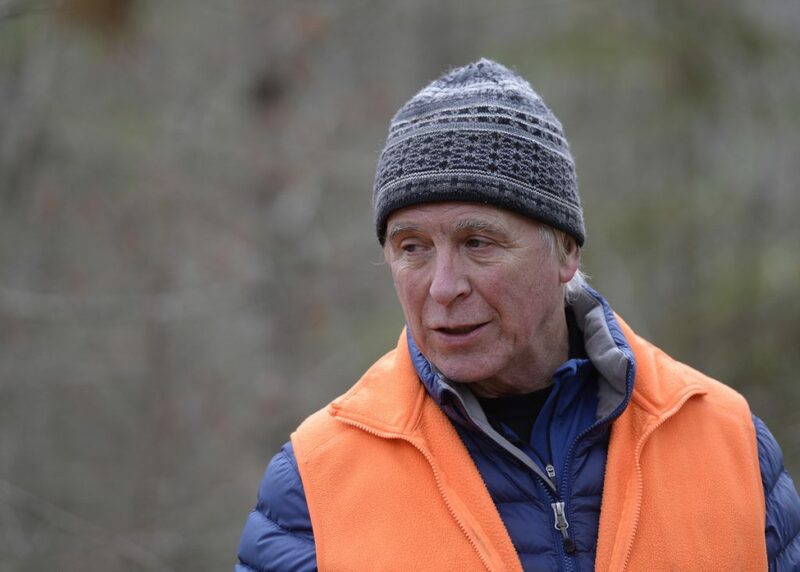 But data aside, on a human level, Witham’s longevity on the project and his breadth of knowledge about these woods is perhaps the most remarkable thing about Holt Research Forest. “I used to say you could blindfold me and drop me down anywhere in the forest, and I would be able to tell you exactly what block I was in,” Witham said. From the late 1600s to the 1940s, this land was agricultural, with farmers using the southern half mostly as a hardwood woodlot – portable mills were used to make shingles from the wood – and grazing sheep and growing vegetables in the northern portion. The land was divided by a long fence running east to west, the remnants of which remain even today. In 1941, a couple named Bill and Winifred Holt bought the southern farm. They purchased the northern portion in 1946. Bill Holt was a psychiatrist (the couple published at least one research project together) who loved being in the woods, and apparently, loved chopping wood as well. He planted white pines in some of the old field areas – Witham said the state distributed white pine seedlings widely throughout the state in the 1950s, encouraging people plant them in abandoned farmland. He took out some firewood and dead trees but otherwise, did little to the land. 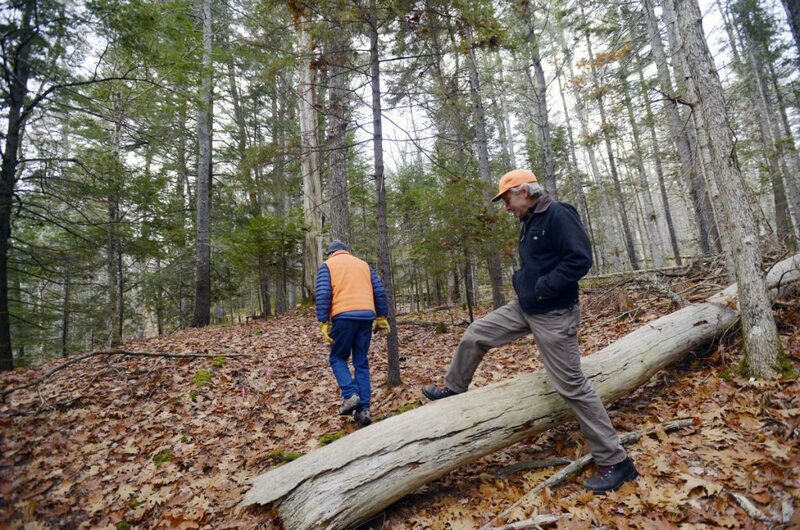 When the Holts were ready to leave the land, they cast around for its future stewards, Witham said, making inquiries to the Nature Conservancy and other conservation organizations before finding a home for it with the University of Maine. The Holt family had enough money to establish an endowment so the forest could be studied long term. (Bill and Winifred’s son Rodney had been the fifth employee at Apple, and when he left the company early on, did so with plenty of stock.) Bill Holt lived a long life, and continued to visit the research forest for many years after making the gift, Witham said. “He just loved this project,” Witham said. But about four years ago, Rodney and other Holt family members who sat on the board were ready to turn it over to another entity. They moved its assets over to the Maine TREE Foundation. Throughout that fluctuation, Witham has been the constant, the man who knows the trees best. When he interviewed for the job, back in the early ’80s, Witham was doing research at the University of Maine in Orono, much of it around the impacts of spraying for the spruce budworm in the 1970s. The state had been fighting the spruce budworm infestation for decades at that point, with varying degrees of success. In 1975, 2.26 million acres were sprayed with three chemicals, including Zectran, and in 1976, more aerial spraying was completed, using Dylox and another chemical. Witham worked with Hunter on a variety of projects, including studying the negative impact of the mass pesticide spraying on ducklings. One of the interview questions for the job at Holt was, was he willing to commit for eight years? In the early days of the research forest, no one knew quite what they’d accomplish. But the directive was clear: Take care of these woods, study them and collect as much data as you can. Witham and others started by setting up quadrants, each one hectare blocks (100 meter by 100 meters, or about 2.5 acres). They used the dividing line of that fence running east to west as an establishing line. Some of the forest’s biggest trees are along that line, leftovers, Witham says, of the days when a property owner might not be totally sure whose tree that was, and so they were left to grow and grow. Witham in the Holt Forest in Arrowsic, where he has worked for 36 years. One of the first projects they undertook was to set up an experiment to see how managed woodlot, i.e., harvested to open up the canopy, compared to untouched forest. “Our goal was to look at how forest harvesting impacted the species that were here,” Witham said. New plants sprang up in the gaps in the managed lots: raspberries, blackberries, sun-craving plants. That first season after the wood was harvested, five pairs of winter wrens appeared. “They just honed in on that change,” Witham said. Every May, before the maple seeds drop, Witham sets up 268 seed traps in a straight line cutting across the property, essentially a string of mesh sacks, separated by 10 meters, intended to catch a representative sample of the seeds the trees are dropping. “We are trying to look at all the different stages of forest development so we have an idea of how that works and how that changes over time,” Witham said. Signs outside the office at Holt Research Forest in Arrowsic. Among the other tasks that fall to Cooper are counting and measuring seedlings between the sizes of 1.5 cm and 9.5 cm in diameter in the strip right around the seed traps (these would be the ones too small for an official tag and number). One of the findings of the study has been that the red oaks that make up so much of the forest are not successfully regenerating. They produce plenty of fresh shoots, but they are decimated by deer grazing in the winter. The carpets of hundreds of lady slippers Witham used to see every spring are gone now; he’ll be lucky to see one a season. They too, are victims of hungry deer. Meanwhile, red spruce is becoming a dominant species in the understory. Is Holt Research Forest like Thoreau’s Walden Pond? When Cooper first began working with Witham, his main duty was catching – and releasing – the small mammals that live in these woods. While there are plenty of deer, some coyote, fisher cats and other animals in the Holt forest, their focus has traditionally been on catching mice, chipmunks and voles. They put out 280-plus traps a night for eight nights in August, with a enticement of rolled oats and peanut butter, and some nesting material to keep the animals occupied, and warm, during the time they are in the trap. That’s a lot of traps to set. Doesn’t it take all day? “It takes maybe four hours to do the whole thing,” Witham said. “I am slower,” Cooper said. They examine the animals, give them an ear tag if they’ve got enough of an ear flap to slip on into, pull off ticks (sometimes up to 40 or 50 on one small mouse) and send those to the Vector-borne Disease Lab at Maine Medical Center for study. These days, almost all of what they remove from the small mammals are deer ticks, Witham said. That’s a big change just in the last 10 years. This year, they caught a record number of white-footed mice, over 180 in one night. There are animals they catch again and again. This study helps them see the correlation between areas of higher seed production and larger small mammal populations. It is the woodland creatures that offer up the most evidence of climate change. There are species of birds that never used to visit these woods that now regularly appear, like the red-bellied woodpecker and the tufted titmice. In his early days in Holt, Witham saw a few pine warblers. “Now they are one of the most abundant species out here.” But the mosquitoes that once made a day in the woods far less pleasant “dropped dramatically in the last 25 years,” Witham said. That might be great for humans, but it’s not great for the ecosystem. Then there are the flying squirrels. Plenty still inhabit the woods, but whereas they used to be the Northern species native to this region, those in Holt Forest have shifted to a Southern species as temperatures have warmed. It once ranged only as far north as Massachusetts, Witham said, but now have taken over much of Maine, driving out the native species. Throughout, the white pine perseveres. Headed east along the old property line, Witham stoops to point out two tiny seedlings coming up out of an old log. “These holes were made by beetles,” Witham said. The seeds sprang from those holes. These pine seedlings are too tiny to be counted now. But maybe in a few years. Or so he hopes. The Holt Research Forest’s mission may be changing, shifting away from Witham’s research. 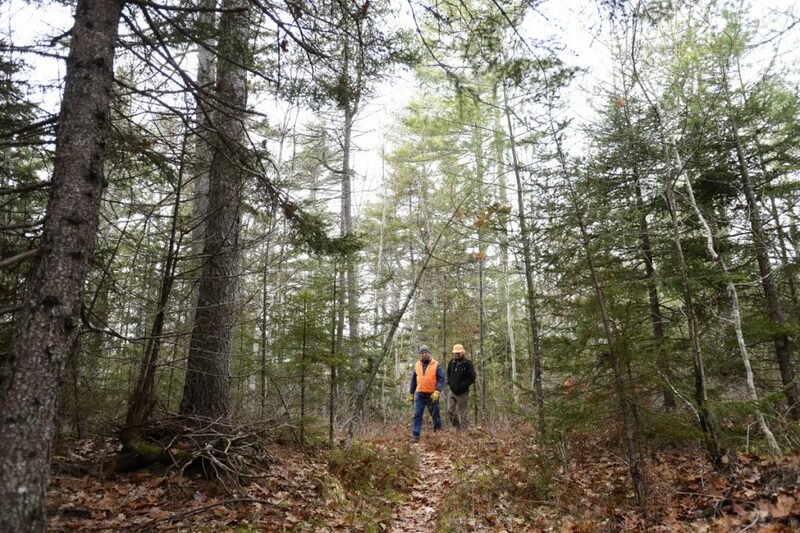 Biologist Jack Witham and data manager Clarke Cooper in the Holt Research Forest in Arrowsic. 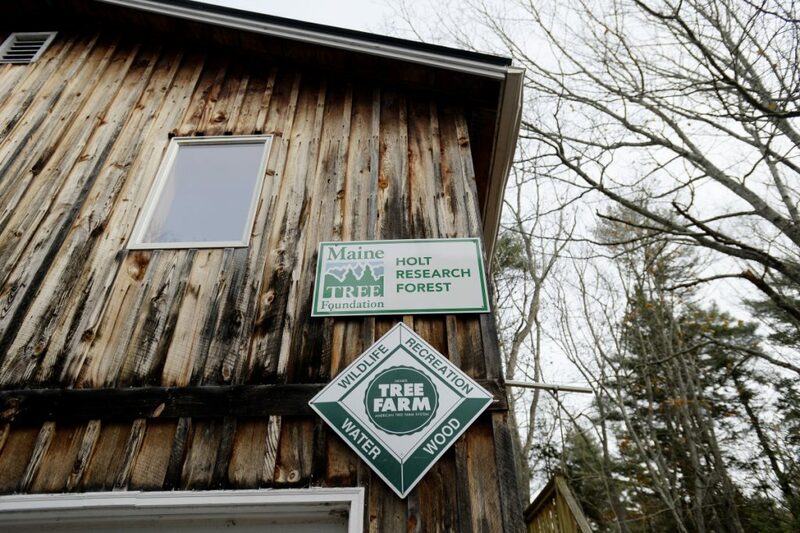 Marcia McKeague, president of the board of Maine TREE Foundation, said the organization is considering opening the forest up to more educational opportunities, including a program that teaches school children how to measure tree growth. A day camp used the property last summer. Hunter worries about the forest’s future as a research station. “You can count us as very lucky that we have had almost 40 years there,” Hunter said. “I do fear that our luck might run out.” Without the Holt family’s backing, he said it has become harder to find the money to run longterm research projects. Grants and graduate student research tends to run more in three- or four-year cycles, he said.